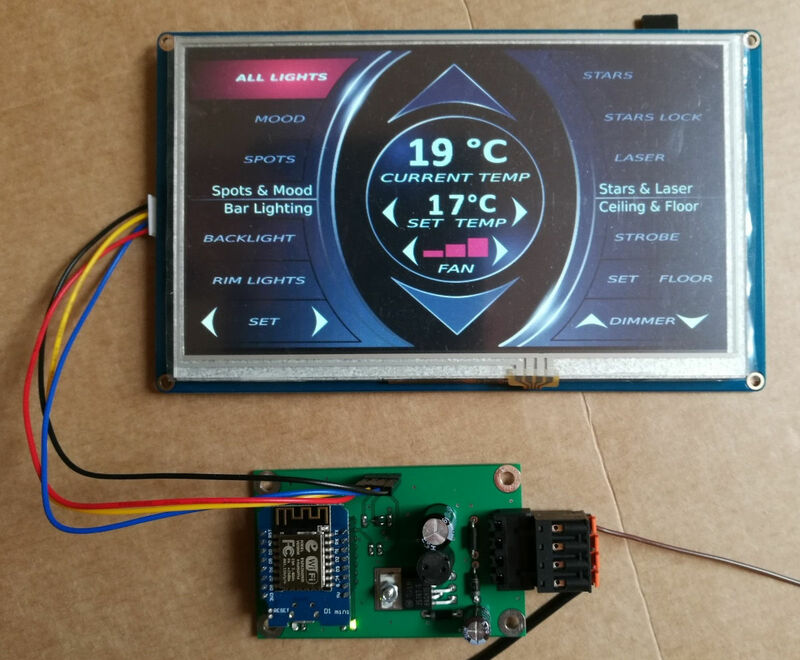 The popularity of the ESP8266 WiFi module has a lot to do with its ability to inexpensively connect to the Internet. However, [hwhardsoft]’s stretch limousine environmental control system explores another use for these modules: a simple way to tie together disparate systems with a common user interface. On a basic level, the problem is one we’ve all faced: multiple devices with multiple control interfaces create an awkward user experience. Have you ever worked in an office with 6 brands of air conditioner requiring 6 different remotes? Because of its low-cost, support for Wi-Fi, serial, and GPIO, ESP8266 boards are a reasonable candidate to create a unified control system for multiple devices. This is even more true for the ESP32, as it adds Bluetooth support. [hwhardsoft]’s use case is fairly straightforward. The limousine (a Lincoln stretch) has multiple LED lighting controllers, climate control, and a laser projector. This was not exactly a smooth user experience, so [hwhardsoft] tied all the controls to two slick touchscreen interfaces (presumably one for the driver and one for the passengers). Each touchscreen sends commands over Wi-Fi using UDP to a control board that switches relays to control the different devices, as we’ve seen previously. While relays are arguably not the ideal solution here, these control boards already existed and were functional, so it would have been wasteful to throw them out. An easy improvement suitable for future projects would be to use NPN transistors to simulate button presses on the remote controls. This works quite well and lowers cost, power, and parts count, while being faster, more reliable, and quiet. If you wanted to build something similar in your home or office, but want to use an Android smartphone instead of a touchscreen, the Kivy Python module allows you to do just that. It’s quite easy to set up a simple interface with buttons, dropdown lists, and text inputs that send data to an ESP8266 over UDP. If you’ve never been a patient at a sleep laboratory, monitoring a person as they sleep is an involved process of wires, sensors, and discomfort. Seeking a better method, MIT researchers — led by [Dina Katabi] and in collaboration with Massachusetts General Hospital — have developed a device that can non-invasively identify the stages of sleep in a patient. Approximately the size of a laptop and mounted on a wall near the patient, the device measures the minuscule changes in reflected low-power RF signals. The wireless signals are analyzed by a deep neural-network AI and predicts the various sleep stages — light, deep, and REM sleep — of the patient, negating the task of manually combing through the data. Despite the sensitivity of the device, it is able to filter out irrelevant motions and interference, focusing on the breathing and pulse of the patient. Our training regime involves 3 players: the feature encoder (CNN-RNN), the sleep stage predictor, and the source discriminator. The encoder plays a cooperative game with the predictor to predict sleep stages, and a minimax game against the source discriminator. Our source discriminator deviates from the standard domain-adversarial discriminator in that it takes as input also the predicted distribution of sleep stages in addition to the encoded features. This dependence facilitates accounting for inherent correlations between stages and individuals, which cannot be removed without degrading the performance of the predictive task. Anyone out there want to give this one a try at home? We’d love to see a HackRF and GNU Radio used to record RF data. The researchers compare the RF to WiFi so repurposing a 2.4 GHz radio to send out repeating uniformed transmissions is a good place to start. Dump it into TensorFlow and report back. Clocks are a never-ending source of fascination to hackers. We get all kinds around here, from Steampunk Nixie clocks to retro cool flip clocks to clocks that don’t even look like clocks. But this is something new — a glow-in-the-dark laser tracing clock. What [tuckershannon]’s clock lacks in practicality it makes up for in the gee-whiz department. The idea is simple: trace the characters out on a phosphorescent screen using a laser. To accomplish this, [tuckershannon] adapted the design of this whiteboard marker robot clock, replacing the drawing surface with glow-in-the-dark stickers. A 405 nm laser diode module is traced over the surface by the two-servo pantograph plotter, charging up the phosphors. He offers no clue as to how long the ghostly image lingers, but from the look of it, we’d bet that it lasts for a good fraction of a minute, especially in a dark room. Then again, you’d want the image totally faded before the next write cycle comes up, to prevent overwriting the previous time. All in all, it’s a nice design and a clever new clock display modality. And who knows — maybe this whole glowing phosphor display thing could really catch on. Chances are anyone who has an entry-level to mid-range smart TV knows that setting them up with your streaming account credentials is a royal pain. Akin to the days of texting on a flip phone, using the number pad or arrow keys to compose your user name and password seems to take forever. So why not avoid the issue with this automated Netflix logger-inner? As if the initial setup wasn’t bad enough, when [krucho5]’s LG smart TV started asking for his Netflix credentials every few days, he knew something needed to be done. An Arduino to send “keystrokes” was the obvious solution, but when initial attempts to spoof the HID on the set proved fruitless, [krucho5] turned to the IR remote interface. He used an IR receiver module to capture the codes sent while entering user name and password, and an IR LED plays it back anytime the TV ask for it. The video below shows how much easier it is now, and the method should work just fine for any other online service accounts. We like [krucho5]’s build, but the fit and finish are a little rough. Perhaps slipping them into a pair of Netflix-enabled socks would be a nice touch? Everyone who wants a 3D printer probably already has one, and even laser cutters and CNC machines are making their way into garages and basements ’round the world. Pick and place machines are the next great frontier of personal manufacturing, and even though that’s a long way off, [Tegwyn]’s project for this year’s Hackaday Prize is bringing us that much closer to popping down 0201 LEDs reliably. This project is a manual pick and place machine — otherwise known as ‘tweezers’. It’s a bit more complicated than that, because the entire idea behind [Tegwyn]’s build is to decouple a human’s fine motor skills from the ability to place components on a board. To do that, this project is using an off-the-shelf, blue light special CNC machine. There’s not much to it, just a bit of aluminum extrusion and some threaded rods. However, with the addition of a vacuum pump, a hollow needle, and a few manual controls to move the axes around, the operator has very fine control over where a resistor, cap, or LED goes. There are a few neat additions to the, ‘put a vacuum pump on a CNC machine’ idea. This is a 4 axis machine, giving the user the ability to rotate the part around a pad. There’s also a microscope hooked up to a small monitor mounted to the machine. If you’re assembling hundreds of boards, this is not the machine you want. If, however, you only need a handful, don’t mind spending a few hours placing parts, and don’t want to go insane with tiny QFN packages, this is a great build and a great entry for the Hackaday Prize. When I presented myself at the SHACamp 2017 info desk bright and early on the first full day of the camp, I was surprised to find that I was to be assigned a volunteer along with my press badge. Because of the way our community is sometimes covered by the traditional media, it was necessary that any journalists touring the site have a helping hand to ensure that they respect the privacy of the attendees, gain permission from people likely to be in any photographs, and generally not be idiots about the whole Hacker thing. I pointed out that I was working for Hackaday and not The Sun, and that as an active hackspace member and former hackspace director I was very much a part of the community attending SHA 2017 who would simply be wasting the valuable time of any volunteer assigned to me. Fortunately for the next volunteer in line they agreed with my point of view, so one of the angels was spared a day of my breakneck walking pace and impenetrable British colloquialisms. It’s interesting therefore a few weeks after the event, to investigate how it was portrayed through the eyes of people who aren’t coming as Hackaday is, from within the bubble. To take a look at that disconnect between what we know about our community and its events, and how the traditional media sometimes like to portray us. Are they imagining the set of a Hollywood “hacker” movie in which assorted geniuses penetrate the computer systems of various international institutions by the simple expedient of banging wildly at a keyboard for a few seconds, or will the reality of a bunch of like-minded technology enthusiasts gathering in a field for several days of tinkering and other fun activities be what makes their reports?